The Russian Federation covers 1/8th of the earth's surface (6,592,812 sq. miles/ 17,075,400 sq. km.) from Europe to Asia. Even after the dissolution of the Soviet Empire, Russia is easily the worlds largest country. Vast plains cover most of Russia's territory. Mountain ranges are found mostly in the eastern and southern regions, with the Ural Mountains constituting a natural backbone from north to south seperating European and Asian Russia. The country has a tremendous wealth of natural resources, producing 17% of the world's crude oil, 25-30% of its natural gas, and 10-20% of all non-ferrous, rare and noble metals mined across the globe. 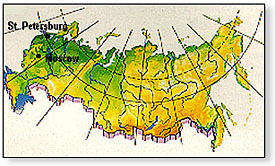 Most of Russia's territory is located in the temperate belt, though the range of climates and habitats spans from Arctic tundra and forest tundra to forests, forest-steppes and semi-deserts. Average January temperatures range from 0 to minus 5 degrees Centigrade in Western European Russia to minus 40-50 degrees Centigrade in Eastern Yakutia. Average July temperatures range from 1 degree Centigrade on the northern Siberian coast to 25 degrees Centigrade in Russia's Cis-Caspian lowlands. Check the current four-day weather forecasts for Moscow and St. Petersburg. Russia has the world's fifth largest population (148.8 million people) after China, India, the United States and Indonesia. It contains some 130 nations and ethnic groups including Russians, Tartars, Ukrainians, Chuvashs, Jews, Bashkirs, Byelorussians and Mordovians. Russia is a democratic state with a republican form of government. The head of state is the President, designed to be the guarantor of legality and governmental compliance with the rights and freedoms of Russian citizens. In accordance with his status, he determines the main direction of domestic and foreign policy and represents the country in its foreign relations. The president is elected for a five year term by national direct suffrage and cannot be elected for more than two consecutive terms. The Parliament of Russia, The Federal Assembly, is the nation's highest representative and legislative body. It consists of two chambers, the Federation Council and the State Duma. Two480 deputies from each of the 89 federation members are elected to the Federation Counil. The 450 deputies of the State Duma are elected from parties and public movements, or as individual candidates.